Nang Ta-Khian, or ‘Mae Nang Ta-Khian’, is a legendary creature, and a commonly believed in ghost in the Pantheon of Thai ghosts. She inhabits the Ta-Khian tree (Hopea odorata) as a nature spirit, somewhat the equivalent of the Western Concept of the Fairy World. It is a Thai belief, that the Mae Ya Nang Ta-Khian Deva dwells witin the Hopea Odorata tree. The area of forest around where the Nang Ta-Khian is dwelling, is always clean and tidy with no under brush, as if someone were sweeping the area regularly. Nang Ta-Khian is normally attractive in appearance, with long hair worn to one side, and a pretty face with slender figure. She wears traditional Pha Tung skirt. Many people who have seen the Nang Ta-Khian say that she dresses just like a forest maiden of old dressed. Phii Nang Ta-Khian is a Thai Ghost who worries about the vicinity around the tree she dwells within, and is extremely protective of her dwelling place. If will become angry and run amok if anyone disturbs her place in the forest. Because of the spirit of Nang Mai Ta-Khian dwelling within the Ta-Khian tree, when a tree is to be used for building a house or a boat, a ceremony must be made to ask permission from Nang Ta-Khian first. Once the tree has been converted into something else, the ghost spirit of Mai Ta-Khian will be converted into a spirit of a different kind, depending on what the tree has been used for; In the case of a boat for example, the Nang Ta-Khian would mutate and become a ‘Mae Yaa Nang Ruea’ spirit. 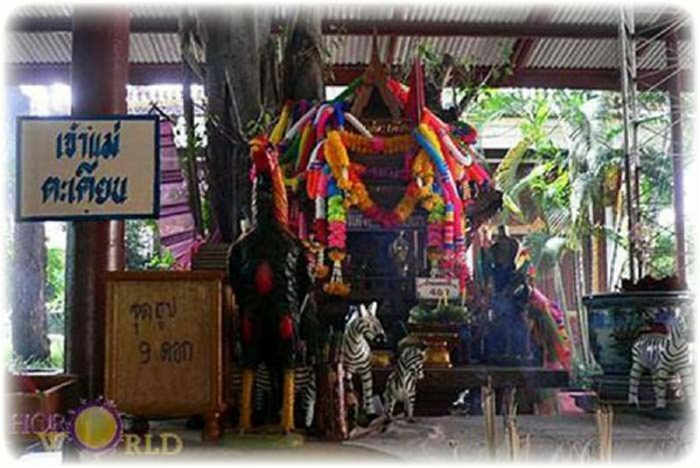 Thai people revere the Ta-Khian tree for the ability of the Lady Deva spirit within it to be able to reveal lottery numbers. 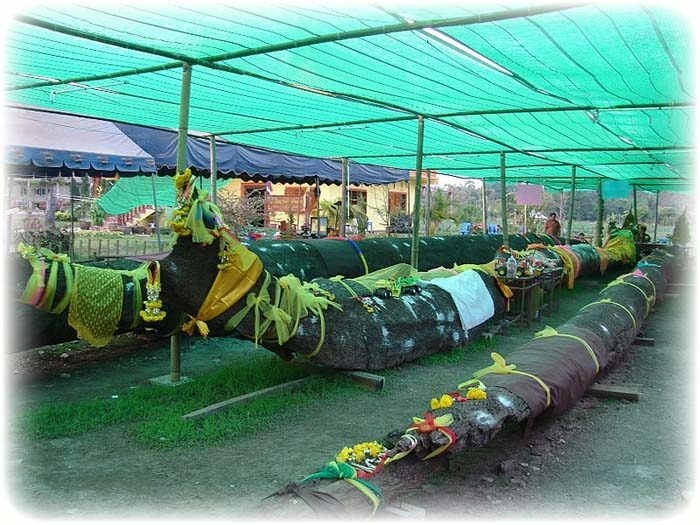 When a Ta-Khian tree is found under the ground or under the water, buried since thousands of years, Thai Buddhists will raise the tree and bring it to a temple, and dress it in colored ribbons, light incense, make offerings to the Mae Nang Ta-Khian Deva Ghost, and ask her to reveal lottery numbers. They will then proceed to examine the bark of the tree to see if any number stand out. The strange thing is the extremely high coincidence of lottery winners who take numbers from Ta-Khian trees. Below; The Jao Mae Nang Ta-khian Tong image shrine in Patum Thani. 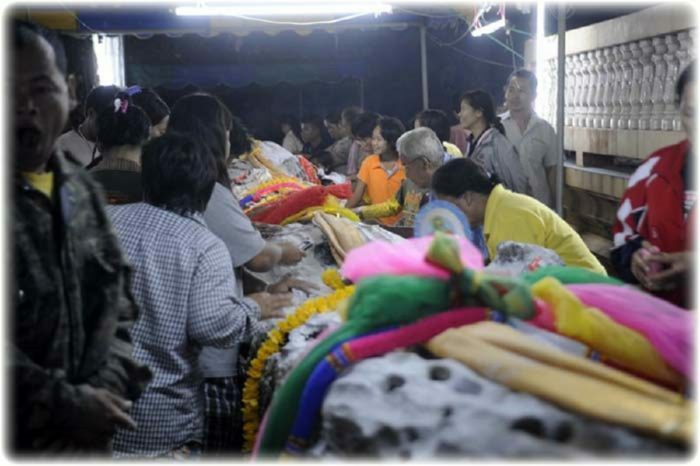 The shrine is number four in the top ten list of Thai Lottery Players Popular Bucha Shrines, for success, it is considered one of the best Prai Devas to worship. The Takian Tree is now in the IUCN Redlist of protected plant species, which has made amulets made from this wood ever rarer, for it is forbidden in the present day to cut and use this wood without official permission. Copyright Buddha Magic ultimedia & Publications © 2017. Designed by MageeWP Themes.